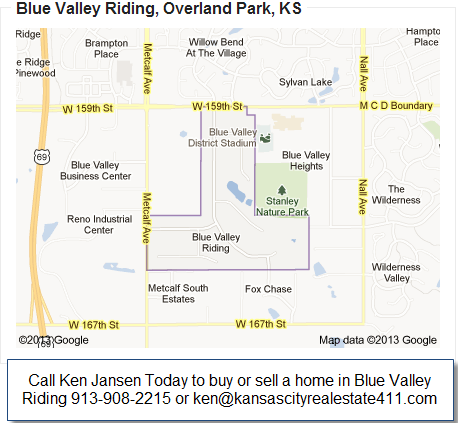 Blue Valley Riding is a 1+ Acre Lot Subdivision in Stilwell, Johnson County, Kansas. You don't want to move "out west" to Shawnee, Lenexa, or Desoto? All of your friends, family, and social activities are in Leawood KS and Overland Park KS? You don't want to spend a million dollars? You don't have a half hour leeway to get to Leawood Town Center? You still want to be within 15 minutes of "real" grocery store, pharmacy, dry cleaners, etc. Blue Valley Schools are really important to you. Blue Valley Riding may be the answer for you. What kind of houses are in Blue Valley Riding Stilwell Kansas? Homes in Blue Valley Riding will consist mostly 3 or 4 bedrooms, with an occasional 5th, 2.0 to 3.5 or more bathrooms, and all of the homes have at least a 2 car garage, with 3rd car garage popping up every so often.